All coffees are available in DeCaff. Add any flavour to your coffee for Free – Caramel, Salted Caramel, Hazelnut. Ask for your choice of milk – Full, Light, Almond, Soy. Our group bookings – six or more people – avail of the same Tapas menu. From the menu provided you choose six dishes to share among your group. We find this works best for the kitchen but it also benefits our groups as the food arrives closer together – allowing groups enjoy the overall Mimosa experience. Each member of your party should receive a selection of the six chosen dishes to the value of €15.00. 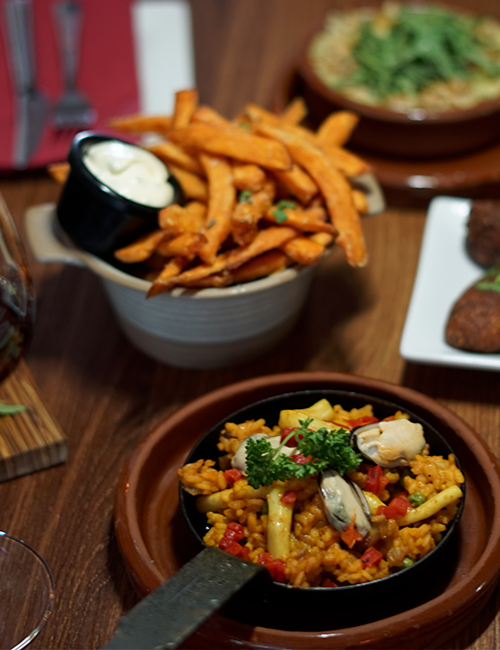 We are very proud of the fact that all our Tapas, desserts, sauces & marinades are all 100% made from scratch at Mimosa. If you have any questions or queries about any of our dishes please feel free to contact us in advance of your visit. For any dietary requirements or intolerances please make us aware so we can ensure your visit with us is as enjoyable as possible. View our allergen list or FAQ section.